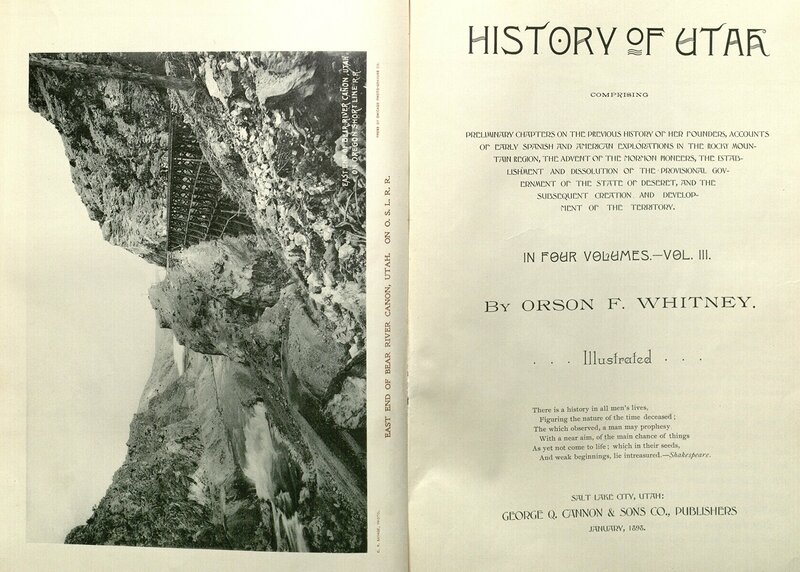 Two of the best sources of information about the enterprise that brought the history into existence are from the autobiographical writings of its author, Orson F. Whitney (the very rare but well-written Through Memory’s Halls), and the superb journal of its principal publisher, Abraham H. Cannon of George Q. Cannon and Sons publishing company. From these sources we learn that although the project started out with bright financial prospects, the increasingly worsening economic conditions of the 1890s, coupled with management and cash-flow problems, gradually deflated the prospects of all involved until it almost did not succeed. A second “ghost” author, Abraham’s brother John Q., was brought in to speed up the work, and controlling ownership of the publishing enterprise changed hands. Also troubling was that subscribers often didn’t want to pay for their very expensive books during the bad times. In the end, only Church intervention allowed it to succeed. “Dr. John O. Williams, who had been connected in a business way with Bancroft’s History of the Pacific States and with Hall’s History of Colorado, proposed to publish a History of Utah; the Church to select the historian and sanction the enterprise, he (Williams) to furnish the means of publication, put the work through the press, and distribute it. The desired sanction being given, I received my appointment, and was vouched for by leading men and women of the community. Thus the work began” (Whitney, Through Memory’s Halls, 201-2). The Church “sanction” (which later became a matter of some dispute) was probably felt necessary because most published works without it were generally anti-Mormon or sensationalized propaganda—not to be accommodated (see Clark, comp., Messages of the First Presidency, 2:315-20; 6:251-52). Whitney continued: “Dr. Williams paid me a salary of two hundred dollars a month, and part of the time my wife drew fifty dollars a month as my secretary. That was all I ever had out of it, though I was entitled by contract to twenty-five per cent of the net proceeds, minus the amount advanced to me in salary. Had the business prospered as anticipated, I might have pressed my claim; but as it did not, I forbore adding to the financial perplexities of the situation” (Whitney, 202). Evidently the use of Whitney’s name and those of the First Presidency—though unauthorized— was part of the sales pitch of certain “agents” or salesmen in their efforts to promote a fine but very expensive set of books to potential customers. Continuing: “My duties were purely literary. At no time did I have anything to do with the business management; yet my name was used, without my consent, as if I had been the very head and front of the enterprise. Certain agents employed by Dr. Williams were reprimanded by him and discarded [fired] for this and other irregularities. But so much prejudice had been engendered that Williams, in June, 1891, sold out the business, or the main part of it, to George Q. Cannon and Sons, whose purchase rescued it from impending disaster…. For my historical labors I was given the use of a desk in the west wing of the President’s Office, and was promised all the help that the Historian’s Office could render. But the scattered condition of the Church records, owing to the operations of the ‘Crusade’, greatly interfered with the realization of that promise. My work, however, was read in manuscript to a committee of which the Church Historian, Franklin D. Richards, was chairman” (Whitney, 202-3). “[June 8, 1891] Bro. [Heber J.] Grant and I went to the Gardo House and reported our labors, and in the course of the conversation the Whitney History of Utah and Dr. Williams[‘s] management of its issuance were discussed. The brethren felt fearful, from reports that reach them, that there is a chance for a big swindle of the Saints in this affair, and, at any rate, the Presidency do not approve of the way their names are used to secure subscriptions to the book. Bishop Whitney was sent for, and asked in relation to the work. He seems to have confidence in the integrity of John Williams, but feels desirous that a committee should give the matter attention, and so arrange the affair that we all feel secure. I was appointed a member of such committee…. “[June 9, 1891] At 4 p.m. I was at a meeting of the committee on publication of Whitney’s History of Utah. The members present were, John R. Winder, Chairman, F. S. Richards, O. F. Whitney, George Reynolds, C. W. Penrose and myself. We considered the charges made against Williams and his agents which come from various parts of the Territory, and Bishop Whitney said that whenever complaints had reached Dr. Williams they had been investigated and corrected. He had made personal visits to settle some feelings which had been created by an agent in Sanpete County. “To allay our suspicions concerning the honesty of Dr. Williams a number of letters were read testifying to his good character, and the bond of $25,000 which he has furnished as security for the faithful performance of his labor has been fully verified. “It was finally resolved to have Bishop Whitney get an extension of time on his bond for the completion of his part of writing the history. The history was to be completed within two years from its commencement, or about one year from today, the bond for which is $5,000, but the author has only done about one half of the first volume up to the present. An extension of time was, however, proffered him. This done we decided to invite the publisher, Dr. Williams to be present at a meeting and hear the charges made against him, after which we will request him to increase his bond to $50,000 as he originally agreed to do. “My fears concerning this matter are very much calmed by the conversation of today…. “[June 12, 1891] I wrote some letters at the office for a short time in the forenoon, and then had a conversation at my room with Bishop O. F. Whitney concerning the History of Utah. He says that Dr. Williams has become so annoyed at the numerous reports which have been circulated concerning his trustworthiness, and his character has been so maligned, that he is determined to get out of the business if Bishop Whitney can find someone who will be congenial to him to buy his interest, which is 45% of the whole enterprise; 5% is owned by F. S. Richards, who is the attorney, 25% by O. F. Whitney, who receives $200 per month as an advance on his share for writing the work, and 25% by Mr. Webster, who is the secretary. The Bishop thinks there is big money in the enterprise for anyone who will buy it. He thinks that Dr. [Williams] will take $10,000 for his share of a business which he feels is worth $30,000. Orson is very anxious for George Q. Cannon and Sons’ Co. to take the business, and thus reassure the doubting people of the certainty of the issuance of the work. We together laid the matter before Father [President George Q. Cannon] and then before the First Presidency. After considerable talk on the subject, on suggestion of Pres. Joseph F. Smith it was decided that O. F. Whitney and F. S. Richards make another effort to get Dr. Williams to continue in the business, but if he refuses to do so, then I had better investigate the matter, and if the results warrant it, buy out his share…. “[June 15, 1891] At 9 a.m. I met O. F. Whitney and Dr. Williams and had some conversation about the History of Utah. The latter is very desirous that we purchase his interest and thus reassure the people of Utah that it will be issued, though he expresses a desire to continue with the thing and work to make it a gigantic success. I presented the matter to the First Presidency who told me to investigate the affair, and if everything was satisfactory to engage in it. Two of Dr. Williams’ agents, Waterman and Clark, called to see me in the afternoon, as they had heard rumors of the pending sale, telling me of claims which they hold against the concern for canvassing services. The former spoke as though Mr. Williams is a rogue, but he was very desirous that I should not tell the latter of his visit to me. Mr. Clark said Mr. Webster had always treated him in the best possible manner. Their claims are really not due until the first volume is issued and delivered. Father’s principal objection to the enterprise is the length of time required by Bishop Whitney to complete the manuscript—5 years from the time it was commenced…. “[June 16, 1891] At 11 a.m. Frank and I met with Dr. Williams, Mr. Webster and O. F. Whitney. We spent several hours in looking over the accounts of the Utah Historical Society and inquiring into the details of the publishing arrangements. The proposition finally made was that the Dr. remain with the business and receive 33-1/3% commission on all orders for books and pictures, and that he sell us 70% of the business with his already accrued commissions for $15,896. The actual orders taken for the book amount now to over 2,500 at $30 per set. Available notes would be turned over to us in this deal to the amount of seven or eight thousand dollars. As pictured by Williams and Webster there is big money for us in this undertaking, but it also means a considerable outlay before returns are had. We presented the matter to the First Presidency and they decided to consider it for a day or two…. “[June 19, 1891] I also wrote a letter to Dr. John O. Williams making him a proposition in regard to the purchase of his interest in the History of Utah. I submitted the letter to Father and Joseph F. Smith before sending it and they approved it. The offer is that we give him $12,000 for all his right, title and interest in the work to date. He is then to receive 33-1/3% commission on all book and picture orders. The amount is to be paid as follows: $6,000 cash down; $3,000 when the first copy of the first volume is issued, and the remaining $3,000 when 2,000 copies of the first volume are issued. In the afternoon he came in the office and accepted our offer with these changes, that he be engaged as canvasser for at least three years, and that a certain date be fixed for the payments of the two latter notes, at such a time as we think the conditions of our proposition are fulfilled. We agreed to these modifications…. “[June 24, 1891] About five hours of today I was engaged in my room with Dr. Williams and Mr. Webster checking up the History of Utah business. I found that about 2,700 bona fide contracts for the work have been obtained. Notes for about $7,500 are on hand. There are time commissions due agents when the books are delivered to the amount of about $7,000. Judging from what appears on the books the business is in a very good condition. We agreed to meet F. S. Richards tomorrow to prepare the legal papers necessary to the transfer…. “[June 25, 1891] At 11 a.m. I met Dr. J. O. Williams and Mr. Webster at F. S. Richards’ office where we talked over with the latter the terms of our agreement in regard to the publishing of Whitney’s History of Utah, and instructed him to prepare the necessary papers for the transfer…. “[June 27, 1891] F. S. Richards, Frank Cannon and I had a conversation with him in relation to the Utah History, and read him the papers in relation thereto. He approved of them with two or three slight changes. At 2:30 p.m. F. S. Richards, O. F. Whitney, Dr. Williams, Mr. Webster, Frank and myself met in the office of the first named and consulted about the agreements for the transfer of the Utah History business. We had considerable talk about their receiving their full commissions out of the first collections on the books, and finally compromised by their agreeing to accept ¾ of their commission out of collections on the first volume, and the other ¼ when the second volume is delivered and paid for. “We adjourned till Monday to finish the business, as we could not do it today owing to the changes to be made in the papers…. “[June 29, 1891] I was engaged in the office till 10 a.m. at which time Frank and I met Dr. Williams and the others of Saturday’s meeting and made final arrangements for the payment of the money ($6,000) and notes ($6,000) this afternoon and the transfer of the business to us. This was done at 4 p.m. when all the papers, etc., were completed and properly signed, and with the very best of feelings we started out on our new venture. “[December 3, 1891] In the afternoon I attended my Quorum meeting at which were present all the First Presidency, Franklin D. Richards and myself; George Gibbs, clerk…. “Bishop Orson F. Whitney was present to obtain information concerning the object in settling this Territory when the Pioneers came here, as he desires to make a statement concerning it in the History of Utah. He had prepared something in which he affirms that the Mormons came here to found a new state for the United States. This is incorrect, as it was the expectation when the people arrived here to establish an independent state, and it was only when this western tract of land was ceded to the United States by Mexico in the treaty of Guadelupe Hidalgo (February 1848) that the Mormons began to seek for admission into the Union as a State, and saw therein their success and destiny. “[January 18, 1892] At noon I went to the President’s office to see about John Q. [Cannon] beginning his labors on the History of Utah in connection with Bishop Whitney. The brethren approved of his undertaking the same, and he accordingly received his instructions from his co-laborer, and will begin his active work tomorrow…. “[February 19, 1892] The remainder of the day I spent in the office attending to work which has accumulated since I left. I found that the manuscript of the first volume of the History of Utah has been finished by O. F. Whitney and John Q., and the most of it is now in print. The reading matter will occupy 720 pages. I am now doing my utmost to crowd ahead the plates so that the binding may be done without any delay. We desire to deliver the book during the next month. “[February 23, 1892] We had a car loaded today with the printed sheets of the History of Utah, which we are sending to Becktold & Co. of St. Louis to have them bound, as we are unable to get them gilded and bound in time for delivery this month, and hands cannot be found in this country in sufficient number to do the work…. “February 27, 1892] I had to borrow from the Deseret Bank today the sum of $2,000 to meet notes of the office which fall due on Tuesday in connection with the History of Utah. I got it for seven months. I hope we will get financial relief when we begin to deliver the first volume, for if we do not I do not know what we will do to meet our engagements. I had hard work today to get enough money with which to pay the workmen…. “[April 19, 1892] Father and I had a talk with Bishop O. F. Whitney today in regard to the second volume of the History of Utah. We urged it upon him to hurry the work along, and he promised to do so with the help of John Q. Cannon. “[April 20, 1892] I was at the President’s office with Mr. Webster for a short time in the afternoon trying to obtain from the Church an additional subscription to the History of Utah of 300 volumes or less; but our efforts were not very successful, though it was not said that the Church would not take more than already ordered…. “[April 21, 1892] We received from the binders in St. Louis (Becktold & Co.) a sample copy of the first volume of the History of Utah today. It makes a most excellent work, both in the contents, printing and binding, and one which pleases and astonishes every person who sees it. The Presidency are highly pleased with it. It is bound in full morocco, embossed in gold and gilded on the edges. “[May 6, 1892] I was at the office most of the day attending to the delivery of the first installment of the History of Utah. We succeeded in getting rid of nearly 150 volumes, and the general feeling is one of satisfaction on seeing the volume, though we have had one or two subscribers who tried to get out of taking the work…. “[August 12, 1893, over a year has passed] I…had a talk with the Presidency concerning the History of Utah. I told them of our inability to meet our bills to the author, Bishop O. F. Whitney, and told them we would like their authorization to pursue our own course with regard to its continuance. Feeling this labor of issuing the work to be a mission on us, I did not feel at liberty to discharge him without the consent of the brethren. They did not decide about it at this time but will give the matter more consideration. Bro. Smith said quite warmly that he considered this work a private enterprise, but Father combated this idea with equal warmth. One wonders if President Cannon would have taken such a firm position on the moral responsibility of the Church if his own company’s involvement had not been at stake. Yet a workable solution was sought: “[August 25, 1893] At 10 o’clock I met with the Presidency and Bishop Whitney, and after some discussion it was decided that the Church will pay him $2,700 for the finishing of the third volume of the History of Utah, and then when we desire to publish it, we are to repay the Church this amount. Pres. Woodruff told me that part of his pay would be in tithing orders, which the Bishop said he would accept.” From other evidence, as given below, it would seem that its own worsening financial problems likely precluded the Church from making this lump-sum payment to Whitney. Abraham Cannon died in mid-1896 before the third volume was completed, and Brigham T. Cannon, a brother, took over daily management of the family publishing company, thus overseeing the issuance of the last volumes. The fourth and final volume does help with answers about how and when the third and fourth volumes came about. In a biographical sketch of Orson F. Whitney included at the end of the final volume is this further explanation: “Mr. Whitney continued to be employed by Cannon and Sons, as he had been employed in the first instance by Dr. Williams, to write the History. The supplemental canvass for books and portraits was retained by the original owners, who refused to sell that part of their interest, and for alleged unfair practices by some of their representatives, the publishers and even the author have been persistently and wrongfully blamed. After the issuance of the first two volumes, in 1892-3, work upon the History was suspended, owing to financial reverses, the author finding employment elsewhere.” This sketch also indicates that the third volume was written during 1896 while Whitney lived in Logan, working as a professor in the Brigham Young College and that “the third volume of Whitney’s History of Utah made its appearance in January, 1898” (vol. 4:705-6). Further: “In presenting an account most favorable to his people, Whitney carefully chooses source materials that support his theses. Such is the vivid, very sympathetic description of Nauvoo by Colonel Thomas L. Kane, great friend of the Mormons. Similarly, he quotes Captain Gunnison’s favorable account of Mormon courts. In fairness to Whitney, it must be made clear that the great bulk of quoted material is legitimate and valuable documentation in support of the historical narrative. Representative of this valuable historical material is the letter of Governor Ford of Illinois to Brigham Young proposing to the latter that he take his people to California. The value of much of the primary data is increased by the present difficulty—if not impossibility—of obtaining them elsewhere” (120-22). Examples of literary excesses are then quoted by Thompson—oratorical, flowery, poetic prose not normally seen in historical writing—and then this comment: “There are more of these ‘literary asides’ in the first volume then in the two succeeding ones, in which he is concerned with the details of court cases, Indian wars, futile attempts to achieve statehood, and the events of the anti-polygamy crusade under legislative enactments of 1862, 1882, and 1887. Undoubtedly such trivial information is included in the 2,327 pages (exclusive of indexes) of the three volumes—information listing orders of march for parades and names of jurymen, and giving lengthy quotations of court testimony. But much of this information, which is squeezed out of the ordinary text book, aids in giving a true history of the period. Those who would blame Whitney for being unduly long must remember that he is doing more than chronicling the history of Utah to 1890. His is also trying to ‘set the record straight’ on such old contentions as the one charging that Brigham Young opposed the coming of railroads and to absolve the Mormon Church and its leaders from alleged complicity in crimes. Thus he gives a detailed account of the death and funeral of Leonidas Shaver, Associate Justice of Utah Territory, to quiet the rumor that Brigham Young had had him poisoned. Likewise, he adduces elaborate evidence to prove that the Church was not responsible for the massacre of Captain Gunnison and his men. “Limitations of space in his two shorter histories of Utah force Whitney to omit most of the long documents and rhetorical excursions common in the four-volume work. The Making of a State and Popular History of Utah are abridgments of the History of Utah except that the narrative is carried forward from 1890 to their respective publication dates. The tone of both shorter histories is less militant, for they were written when an era of mutual good feeling had replaced the old bitterness between Mormon and Gentile” (125-26). It is likely that Woodruff Thompson did not know that John Q. Cannon worked as a ghost writer on parts of the history (he does not mention John) and that could account for changes in tone and literary style throughout. One wonders if the impact of Whitney’s History of Utah gave impetus to the organization of the Utah State Historical Society, founded in 1897, since both the book company and the later society were given the same name and one followed the other by only a few years, Whitney himself serving a term as the state society’s president.